It was early Sunday morning and I was thinking about what to cook for breakfast I remembered the amazing looking Almond Butter Blueberry Pancakes I had seen on The Lemon Bowl Blog. Liz had shared an amazing recipe featuring some of her favorite Made to Matter products from Target. I remember how my stomach started growling when I came across these hot cakes on social media and decided there was no better time than the present to give them a try. Fortunately I had most of the ingredients on hand, including a brand new bottle of Mohawk Valley Trading Company Pure Maple Syrup. This dark, robust syrup is made primarily from sugar maple sap which is preferred for maple syrup production due to its higher sugar content. It is one of the best maple syrups I've tasted and I am always looking for excuses, like these pancakes, to use it. I tweaked Liz's recipe slightly to work with what I had on hand and below is my version. I highly suggest giving them a try! In a large bowl, whisk together dry ingredients. In another bowl, whisk together wet ingredients. Mixture will be slightly lumpy. Slowly pour the liquid mixture into the dry mixture and stir until ingredients are just incorporated, being careful not to over mix. Fold blueberries into mixture. Pour batter on a pre-heated griddle, about 1/3 cup at a time. Pancakes are ready to flip when bubbles start to form. Flip and continue cooking on the second side until golden brown. I have an ongoing relationship with Mohawk Valley Trading Company & have received products from them. All opinions are my own. Love baking with almond and these pancakes look terrific! These look and sound delicious! I love almond butter too! These look awesome and I love the addition of yogurt! Oh yum! I am ready for breakfast now! I love them, they look rustic, with great flavor. Blueberry pancakes are the best and YES to that maple syrup! Love the Greek yogurt in these! Now you've got me dreaming about brinner! 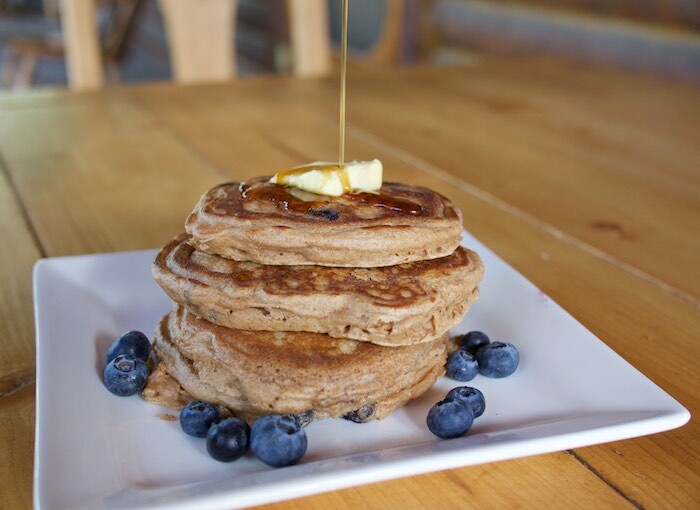 These look delicious...and natural maple syrup is the best. What dreamy looking pancakes! We only use natural maple syrup in our house -- it's so much better! Liz has some of the best recipes around. That rich, dark color on the maple syrup is the perfect pancake accessory! OMG- I want these in my belly right now! So fluffy and thick!